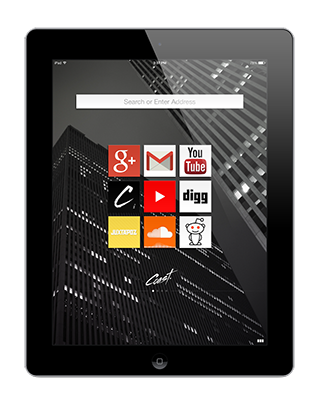 Coast by Opera, the made-for-iPad web browser, is out and about with an updated version today. Improving on the innovative Coast by Opera browser is no easy feat, much like writing that follow-up to a hit song or a best seller. The changes in this first upgrade of Coast will make you stop and appreciate the small things. Coast by Opera has introduced a new way of browsing the web on the iPad. Made with the iPad in mind, every nook and cranny of the browser is optimized for touch and gestures. Out went the old scheme with back and forward buttons, in came swipe motions and new ways of viewing the most important element of your web browser: the webpage. A lot of Coast users are avid music fans and discover lots of new sounds daily. With this update of Coast, music on the web has never sounded better. Did you get a hot tip about a cool remix on Soundcloud? Just head over to the webpage and start playing, no extra app needed! The pages that play music or sounds visualize this in the home screen by showing off a small animation of a graphic equalizer in the website’s icon. You can even control music on the webpages from the iOS lock screen; it’s as easy as if it was in the native music player app. In our humble opinion, that’s pretty neat. Your browser is one of the apps you spend a lot of time in, so why not make it yours? In Coast, it’s now easier than ever to customize your home screen with the image of your choice. You could already choose a picture from your favorite website; after the update, you can also choose between your own pictures on the iPad or from eight of our specially selected backgrounds to style up your online life. One of the biggest pieces of feedback we got from our users was to better integrate PDF documents in Coast – so, of course, we did it. Now, it’s easier than ever to control where you want to store that self-published book from your hipster friend, PDF bus timetable or instruction manual for your coffee machine! In other words, if you want to open that PDF outside Coast or save it, Coast lets you choose a PDF-compatible app. Of course, it wouldn’t be a proper step up without some under-the-hood changes to Coast. Our engineers have been hard at work to optimize, scrutinize and visualize all the aspects of Coast, to give you the best surfing experience possible. There are great improvements in speed to navigate between pages; most of the time going back to the main page will happen in an instant. The Coast security engine, the one that provides you with actual useful information instead of obscure symbols, has been updated to recognize attacks even better. Get Coast for Apple iPad for free in the Apple App Store, click here!